The fall is a beautiful time of year for Dartmouth and New Bedford area pet owners and their pets. Seasonal pet tips can help you to stay on top of their changing needs, while providing top quality vet care for cats and dogs at your local Dartmouth vet hospital. The cool, crisp air feels so good after a long, hot summer, but it is important to be aware of the potential dangers and common issues that can plague pets in New England during this time of year. Start your season off right with a visit to Anchor Animal Hospital in Dartmouth for an annual check-up. If your pet hasn’t seen the vet yet this year, now is a great time. Seasonal pet tips, the annual work-up for vaccinations and preventive treatments and regular check-ups can really help to prepare you and your pet for the coming seasons. If you have any questions about things like heartworm treatments, flea and tick prevention, as well as other seasonal issues, make sure to ask your vet when you visit. If you own a pet in Southeastern Massachusetts, there are some things that you need to know that could possibly affect your pet. This is especially true if you have pets that wander your property or outdoor cats that wander the neighborhood. Speak with your vet about safety issues regarding pets that are not under your direct supervision and get seasonal pet tips that can help outdoor pets to stay safe all year-long. Rodenticides – Rat and mouse trap use rises in the fall, as many home owners put out bait to prevent rodents from coming indoors as the weather cools. Unfortunately, all of these poisons are very toxic to pets, requiring emergency vet care for cats and dogs even if they just come in contact with these materials. The results can be fatal if your pet ingests rodenticides, so make sure to pay attention and keep these things away from your pets. Engine Coolant – As you are preparing your home, family and pets for the colder weather that is to come, your neighbors are also preparing their vehicles for the change in temperature. Many coolants are highly toxic, so any spills that are made while changing them out for the season should be cleaned up right away. Propylene glycol based coolants are less toxic than other engine coolants, however they are still dangerous and require care when used around pets or in areas where pets might go. Back to School – When the kids go back to school, they often have lots of new school supplies that are colorful and smell all fresh and new. This can be exciting for dogs and cats as well, so it is important to keep things up and away from pets, such as new backpacks filled with pencils, glue sticks, markers and other items that can be toxic or cause intestinal blockages if consumed. Even new back to school shoes, socks and other clothing can be enticing to pets. Dartmouth and New Bedford pet owners should make sure to keep all things that might be consumed by pets out of their reach and consider putting them in a separate room or crating them when they can’t be supervised to prevent problems from occurring. 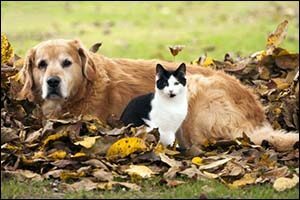 Fall Leaves – In a region that is known for its beautiful fall foliage, it can be difficult to stay on top of fall leaves, but if you have outdoor cats or dogs that go out into the backyard, it is very important. Fall leaves can harbor all sorts of dangers, including mold and mildew following an autumn rain, insects and snakes, plus the leaves themselves can be tempting for dogs to chew on and consume. Depending on the type of trees surrounding your home, they might even be toxic. Poisonous Mushrooms – The spring and fall seasons are the best time for growing mushrooms. Despite the fact that 95 percent of backyard mushrooms are not toxic, you don’t want to take the chance that your pet will find the ones that are. Some mushrooms are highly toxic, while others are less dangerous, but if you find out that your pet has come in contact with mushrooms, contact your local Dartmouth vet hospital. They can also provide you with other seasonal pet tips for keeping wild mushrooms away from your pets in the first place. Wild Animals – Our local area has its share of wildlife, from raccoons to squirrels, opossums to deer, rats to skunks, snakes to bats, and just about everything in between. If your pet comes in contact with a wild animal, make sure to come in for vet care for cats and dogs to ensure that they haven’t contracted an illness, disease or picked up a tick. New Bedford pet owners and pet owners throughout Southeastern Massachusetts should bring pets in for emergency vet care, regular check-ups, vaccinations, and preventive care for the autumn and winter months. Seasonal pet tips are used to protect pets during these seasons. It is a good idea to get your pet’s check-up at our Dartmouth vet hospital as soon as possible. Give us a call at 508-996-3731 to schedule an appointment or to learn more about vet care for cats and dogs, pocket pets and exotic animals in the South Coast region.